Hello, friends! 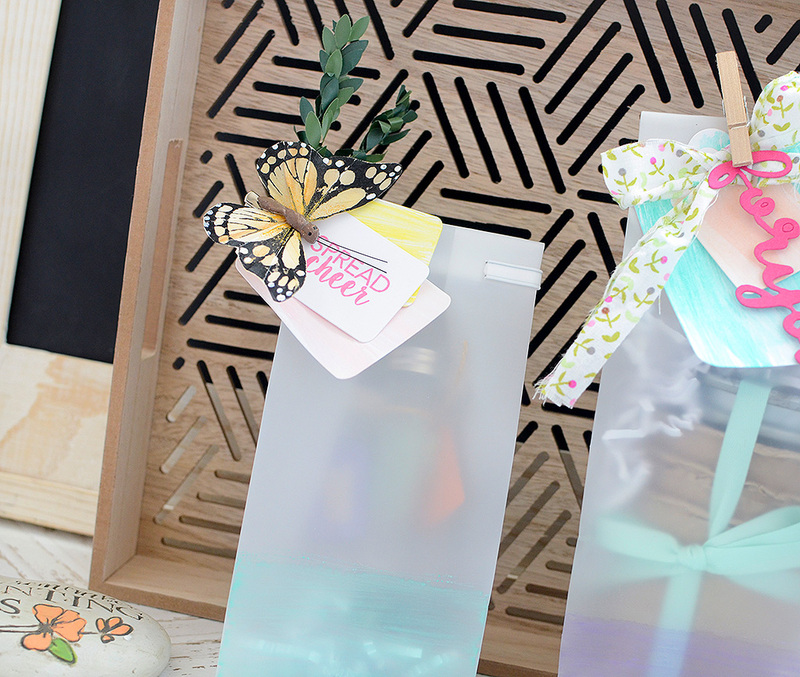 It’s the 6th of the month and I’m excited to be here sharing some packaging with you today! It’s officially spring and, looking ahead to Mother’s Day, I have a gift collection inspired to bring out the gardener in all of us. My 81-year-old mother-in-law still spends hours in her garden every week, tending to her orchids and succulents with great care. I put this packaging post together with her in mind. 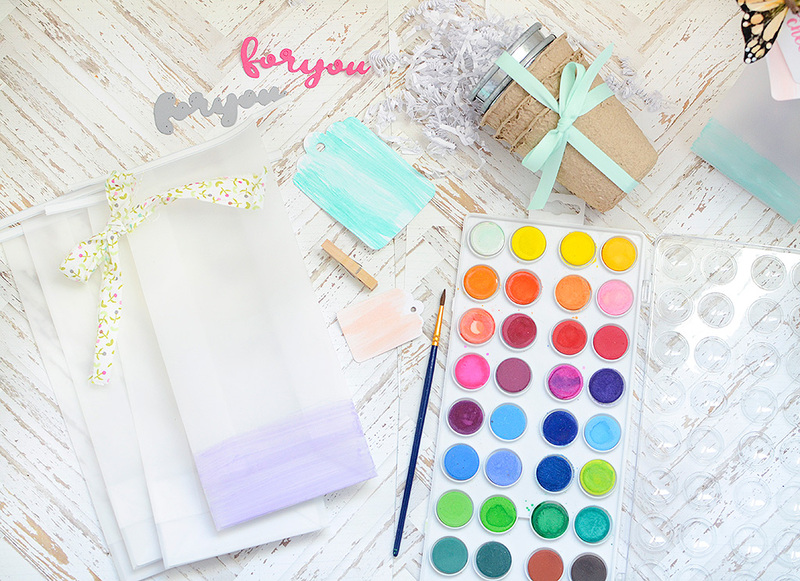 I recently received a box of awesome Papertrey Ink packaging supplies and today I’m focusing on the Frosted Tin Tie Bags and Trendy Tubes. As I mentioned, Mother’s Day and gardening were very much on my mind as I was deciding on this month’s Ambassador post. There may have been a touch of inspiration from the Target Dollar Spot, too, but mostly, I wanted to put flower seeds in the small shaker tubes!! There are 3 tubes in all and they contain 2 kinds of zinnias, along with some bachelor button seeds. 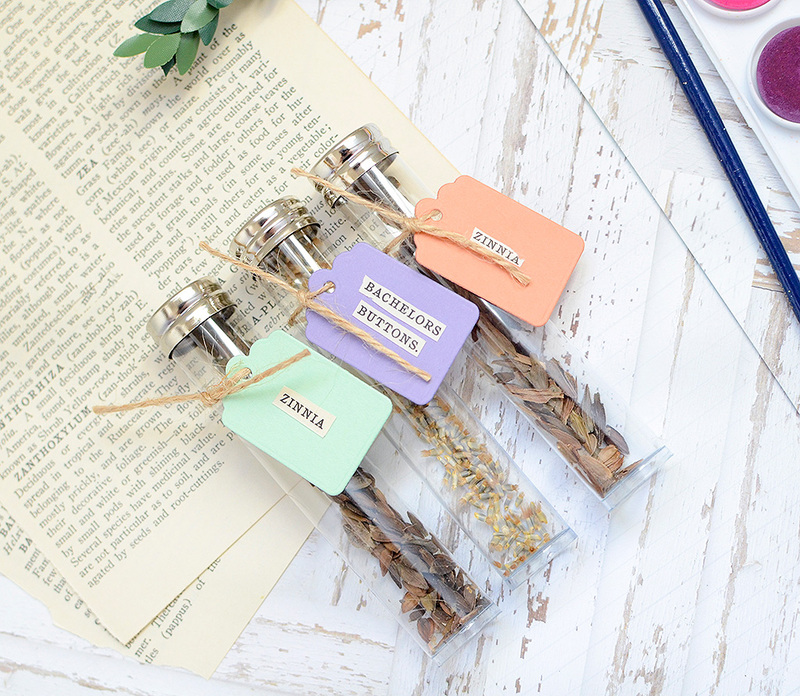 I trimmed 3 tags from the smallest die in the Scalloped Tag die collection from Melon Berry, Vintage Jadeite, and Winter Wisteria cardstock to tie around each tube. Then I cut each flower name out of a page in an old Flower Encyclopedia. If you don’t have one of those, you can type or handwrite the names; perhaps you even have a stamp of the flower name! After adhering each word to one of the tags, I secured them to the tubes with jute twine. 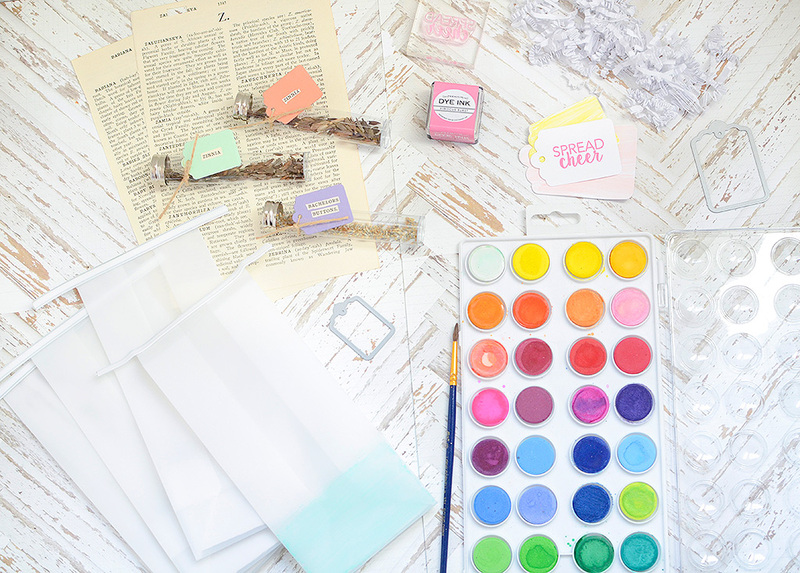 After wrapping up Easter this past weekend, I have to confess that I’m still feeling very “pastel” so I decided to add soft color to my bags with some watercolor paints. I used a basic Loew Cornell 24-pan palette, and to achieve a more saturated pastel, I added less water to my brush. 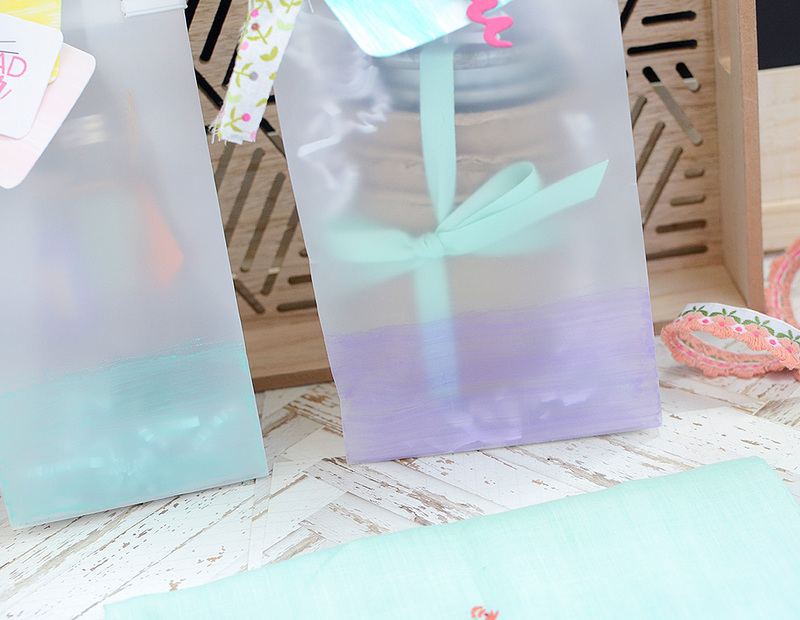 Also, given the soft surface of the bags, you’ll want to give them some extra time to dry. T coat the lower portion of my bags, I chose purple and minty green (you might say Winter Wisteria and Vintage Jadeite if these were PTI colors). You’ll also notice I have 2 different sizes of bag. The smaller one holds the seed tubes, padded with some Stamper’s Select White Cardstock shred that I ran through my paper shredder. The shred keeps the tubes from rolling and sliding around. 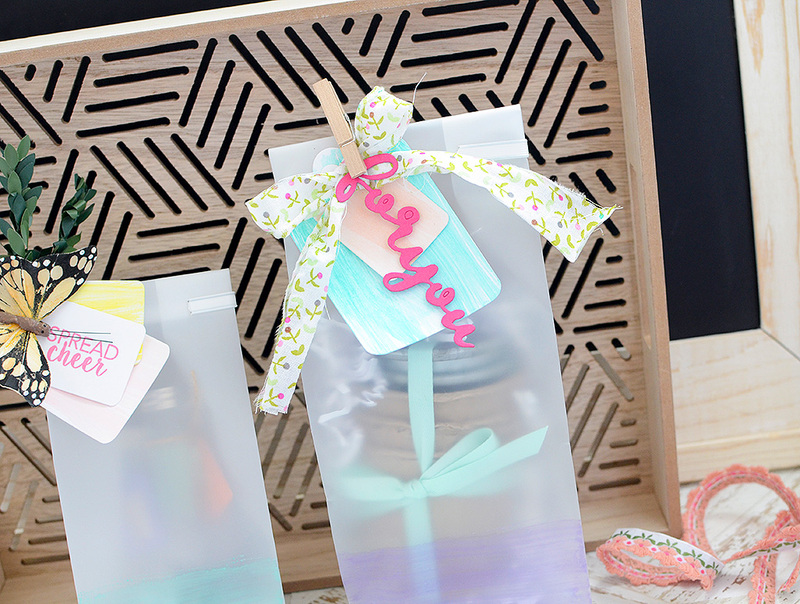 Wishing to carry the watercolor look throughout all the packaging, I cut several tags in different sizes from the Scalloped Tag die collection and painted them as well. On one of the smaller tags, I stamped “spread cheer” in Hibiscus Burst ink and layered three tags together. 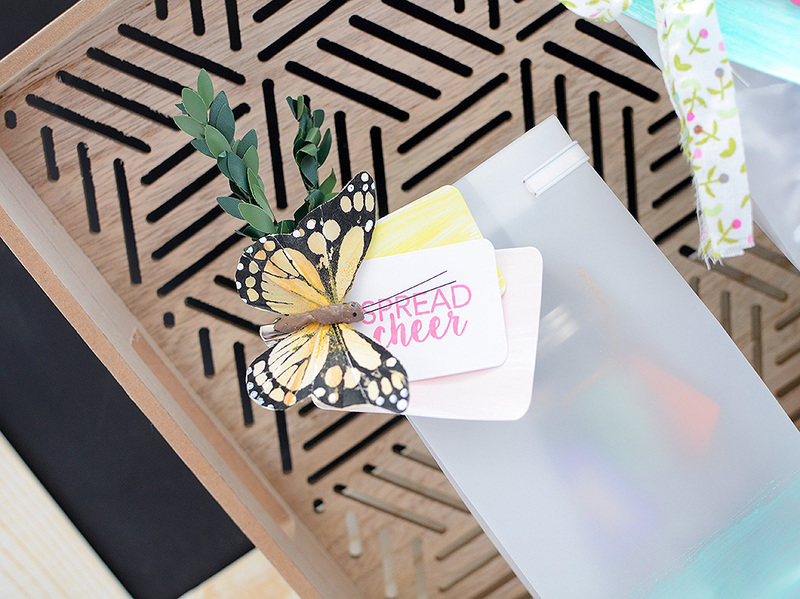 A cute butterfly clip and some faux greenery accent the tags and secure them to the bag. The second, larger, bag contains some small pots so my mother-in-law can plant her seeds. I tied them together with Aqua Mist Twill ribbon and placed them in the larger of the two bags, cushioning them in the bag with more White shred. 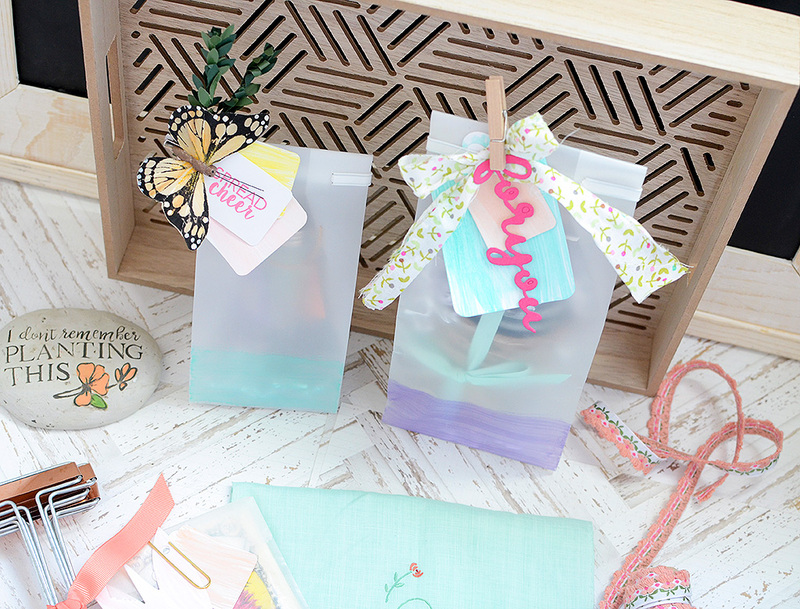 Because the bags are translucent, it was important to me that whatever is inside of them look pretty and thoughtfully put together, so the ribbon binds the cute pots and adds a note of welcome color. 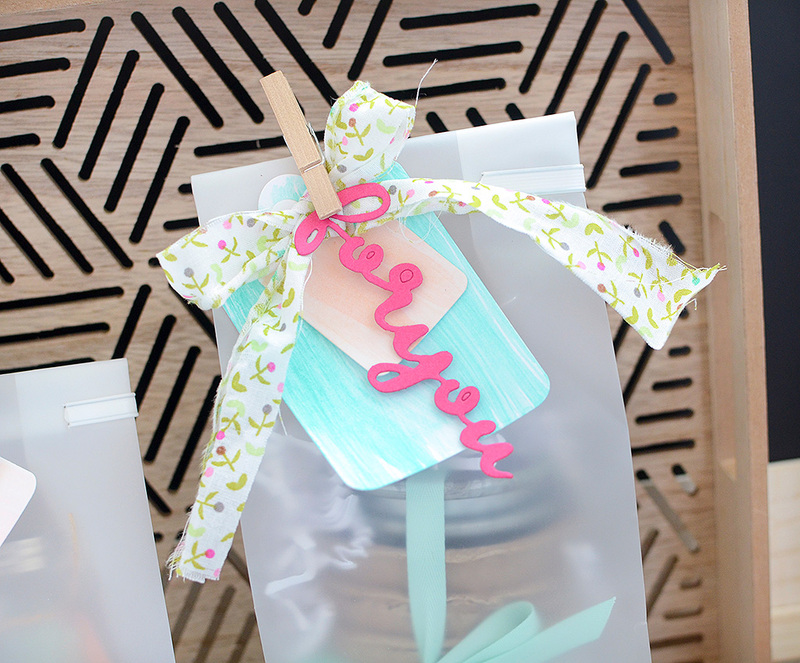 To go with the springy shade of purple I brushed along the bottom of the bag, I painted the largest scalloped tag in the mint green I used on the first bag, then a smaller tag in a pale orange, similar to PTI’s Melon Berry hue. 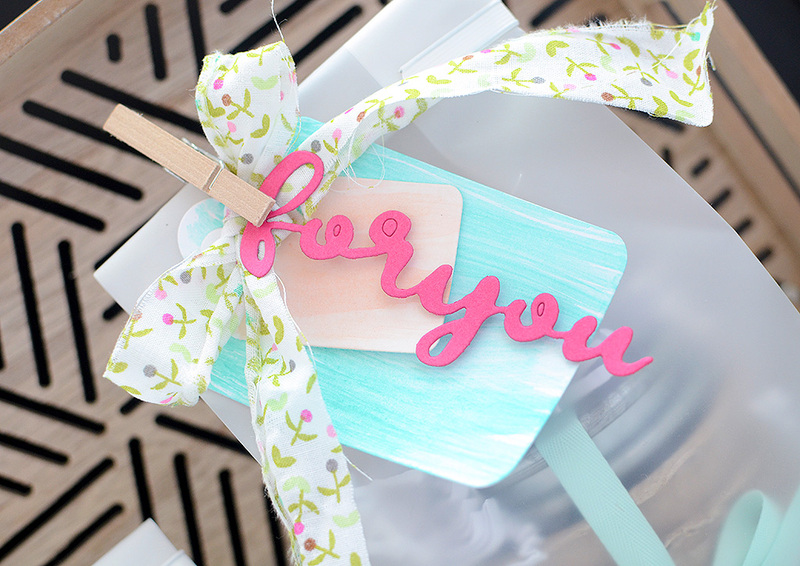 To accent this tag set, I made a bow from a floral fabric scrap, and cut “for you” from Raspberry Fizz cardstock. That die can be found in the You Deserve Flowers Sentiments collection, and I chose the deeper shade of pink to add some contrast to the package. I did try lighter shades of pink first, but they didn’t have quite the same pop as RF. Along with the seeds and pots, I’m including some other inexpensive gardening tools and accoutrements–extra seed packets, plant markers, a whimsical decorative stone, a lotion bar, and a vintage embroidered handkerchief. I hope she loves receiving it as much as I loved putting it together! 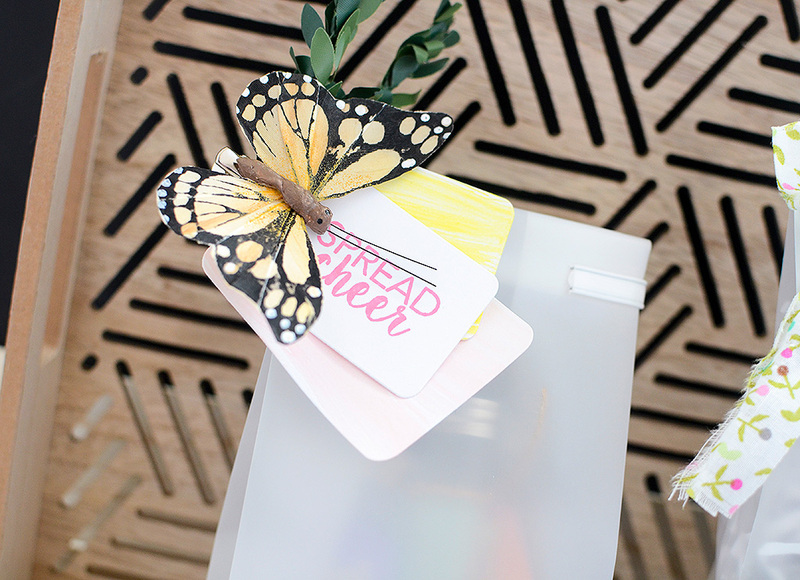 – Substitute the butterfly clip with a handmade felt flower clip. PTI offers loads of dies–perhaps try the Bloom Builder series–and lots of felt to choose from! Switch out the greenery with some leafy vines or stems, either real or use paper ones cut from a die. HERE are a few favorites. – I chose a minimal route for my packaging today, but if you want to add more stamping to your own packaging of this type, I don’t have to tell you that PTI has dozens of gorgeous flower stamp sets! I typed “garden” into the Search bar in the shop and got great results–PTI definitely has you covered! – Coordinate your gift with PTI’s Year Of Flowers series, featuring violets, roses, mums, sweet peas, and more. As always, I appreciate you stopping by today. I’ll be back next month with something fun for the kids! I love the idea of packing seeds in the tubes! Thanks for sharing! 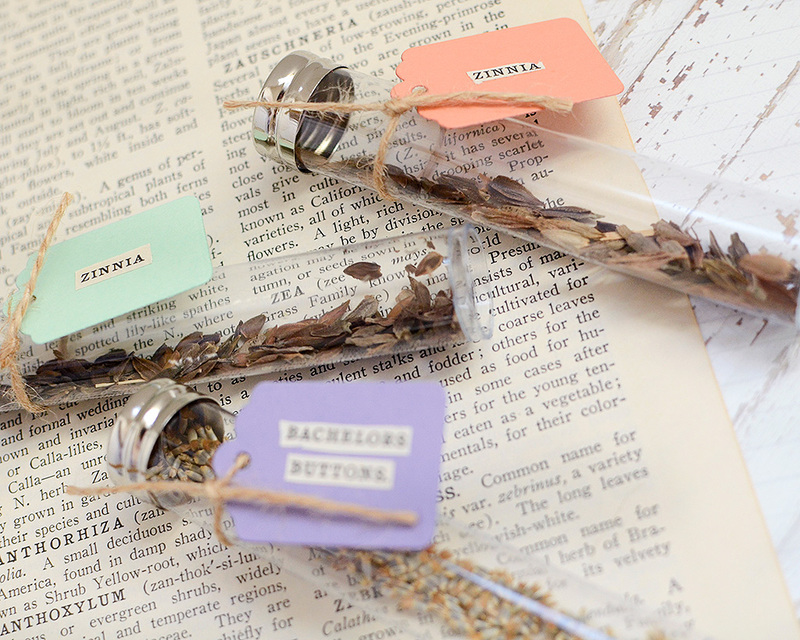 Such pretty packaging Rebecca and a very clever idea for presenting the seeds. 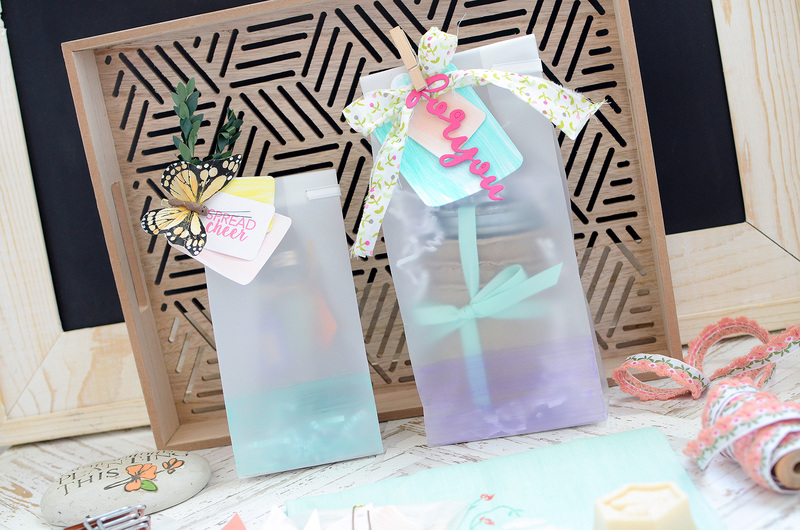 Such a clever idea for your MIL, Rebecca, and adorable packaging! Such clever packaging! 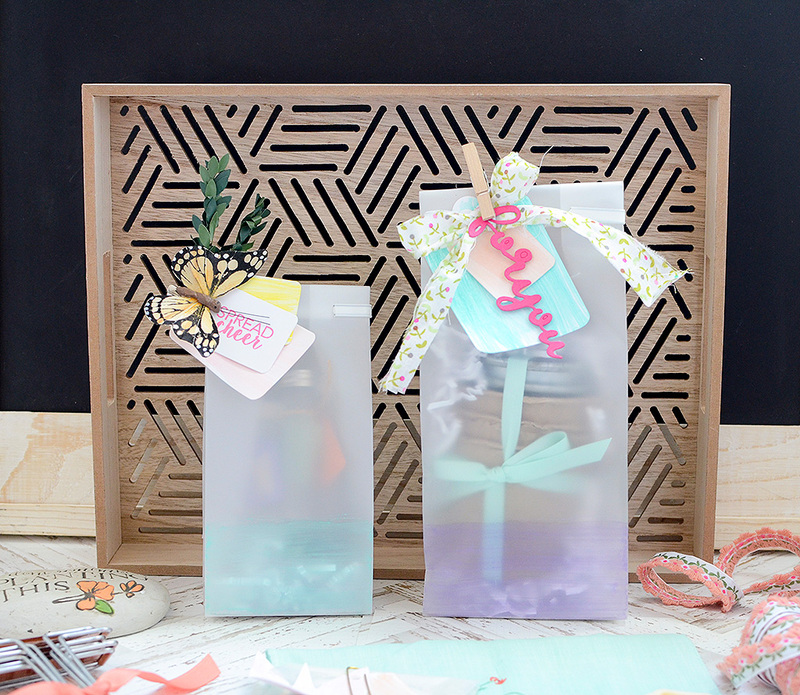 Never would have thought to color the bottoms of the bags–love it! Beautiful presentation! Thanks for the tip about adding water color to the bottom of the bags. I love the soft look it gives but I doubt I would ever have thought to give it a try. This is so sweet! Your MIL will love it! Any gardening fan would. Beautifully packaged and assembled. Thank you for all the tips! Beautiful. What a thoughtful gift. Loved this post. Your mother in law will love it! Where can I buy the trendy tubes?